You may have noticed by now that I am rather fond of dishes that involve custard. This is partly because I can only get Vla in the Netherlands, which is too sweet for use on desserts, and has been thickened with flour; but partly because homemade custard is much more tasty than it’s packet counterpart . It would, indeed, be possible to add Bird’s Custard to the list of Stuff Visitors Must Bring From the Motherland, but actually, making custard is relatively easy, so I don’t usually bother. As it is so easy, and I have a couple of recipes coming up that require custard (and many more to follow, I’m sure) I thought that I would give a quick step-by-step guide, to save me typing out the method all the time. The recipe calls for the use of vanilla bean. I know they are expensive, but they really are superior to using vanilla extract, so try to get them if you can. There is a good vanilla bean paste on the market too, that would be a better substitute if you really have to. Of course, I have managed to find a way to eke out the most value from a single vanilla bean, and nothing is wasted! Most of the time, a recipe will call for you to split a vanilla pod in half, then add all of the seeds, and the pod to the warming milk/ milk replacement. 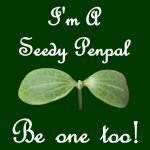 I usually only ever scrape half of the bean, and add the seeds to the liquid. The exception to this is when making ice cream, or a LOT of custard, as these will require a whole pod. I always add the split pod too, but when the milk has warmed through, I remove the pod, rinse, and dry the halves. When they are dry, I put them aside in an airtight container (a small jar with a lid). The next time that I need to make a custard, I still have seeds from half of the pod, and the old pod to add to the milk, so I get double the custard for the price of one. Still not done, you can then dry the pods for a second time, and snip them into shorter lengths. Add these to an airtight jar filled with sugar. The remaining oils in the pod will infuse, leaving you with vanilla sugar. This is a much more acceptable substitute for vanilla pods in your next batch of custard, than using vanilla extract. There are many other recipes that you can use this in. I find stewing fruit with a little of this sugar is a really great addition. The vanilla pods will continue to be useful in this way for a few weeks. When they are dried up, they have imparted all their flavour to the sugar, and only then should you discard (or better yet, compost) them. That is a lot of value from one lowly bean, making it all a lot more worthwhile! I have not given proportions here, as this will vary from recipe to recipe, whether you are using milk, cream, soya milk or even coconut milk (which is excellent in custard – I recommend that you give it a go). You can also make savoury custards but the methodology differs, so this is for sweet custards only. The milk (or replacement) has to carry the flavour. Usually, this will be vanilla, but could also be cocoa, ginger or fruit syrups. Whatever flavour you are adding needs to get heated with the milk. Some flavours, like the vanilla will infuse sufficiently having been brought up to the boiling point. 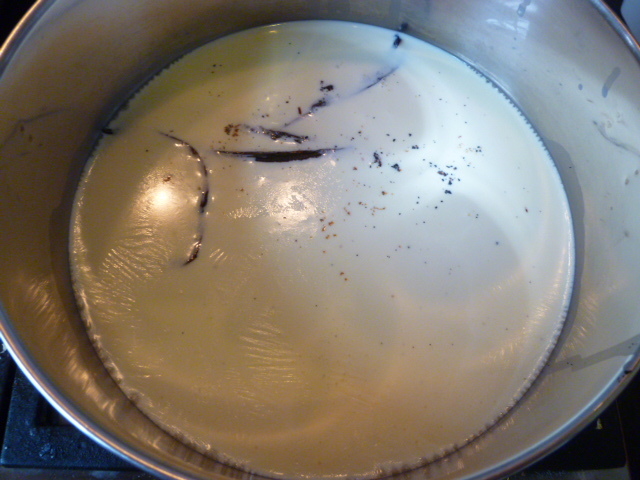 Others will need to steep for a while before you heat the milk, to intensify their flavour. Whichever way, you will need to gently bring the milk up to boiling point, but try not to let it boil. You will have reached this point when there are small bubbles at the sides of the pan. Take it off the heat at this point. While the milk is slowly coming to the boil, separate your eggs. I have assumed that a picture is not necessary for this part of step two. Be careful not to get yolk in your whites. I advise breaking each egg over a small, separate container before adding the whites and the yolks to the main batches. This way if any do break, you haven’t lost the lot. I have also taken a risk on scooping out some egg yolk when I managed to get a little bit (and I stress it was little) of yolk in my whites once when I didn’t follow my own advice, and it turned out OK, with no discernible effect on the yolks, but it was not great worrying about it. Don’t throw away the egg whites. They make great meringues and macarons. They also freeze well, if you don’t have time to do something with them straight away. I would love to hear any other suggestions for using up egg whites, particularly in savoury dishes, if you have them. Although egg white omlets need not apply! 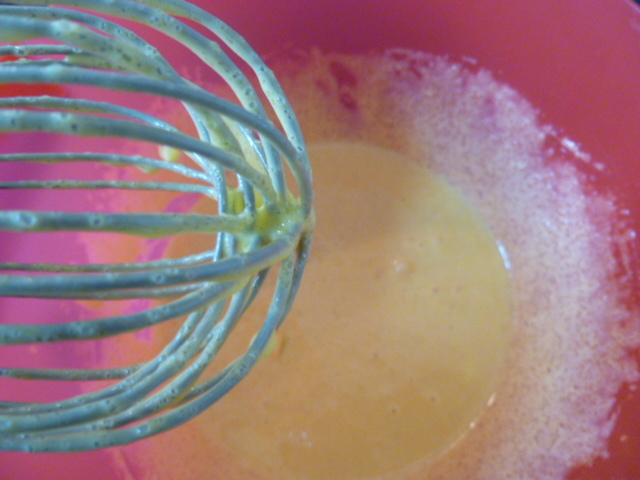 Once you have your egg yolks, you need to combine with the sugar, by whisking them together, until the mixture is pale. A tip here is not to add the sugar to the egg yolks unless you are going to whisk them straight away. If sugar is left on the yolks, it will change them, and a skin will form, making the end result a little bit lumpy. This would be the time not to answer the phone if anyone rings! It is the yolks that act as the thickening agent. I have heard that it is possible to make a sort of vegan custard, using soy flour as a thickener, and coconut milk, but I have never tried this method. Anyway, my point in telling you this is that you need the egg yolks – don’t be tempted to cut down on these, unless you also cut down on liquid too. Some people will tell you that this is the hard part of the custard making process. As long as you don’t let it intimidate you, and you have a bit of patience, it need not be difficult. There is a risk that you could scramble the eggs, if you heat them up too quickly in one spot. This only happens if you apply direct heat to them, or if you try to add too much hot liquid at once. An easy way to get around this is to only add a small amount of milk at first (really, only 20-30 ml), and make sure that you have whisked it in well before adding the next lot of milk. 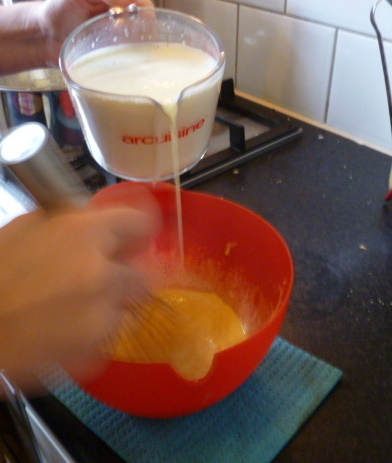 You will need to put a damp cloth under your bowl, as I have done here, to stop it sliding around as you whisk, which leaves you with both hands for custard, not bowl-stabilisation. You can gradually increase the amount that you add each time. At some point, the egg will become quite liquid, at which point you have custard – congratulations! 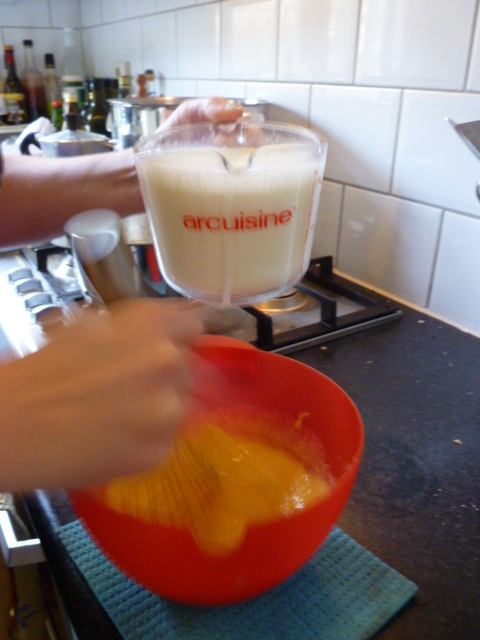 You can add the remaining milk in a continuous stream, as long as you continue to whisk the custard all the time as you do so. I usually continue to whisk the custard for a little while, once all the milk has been added, more from habit than anything else, I think. 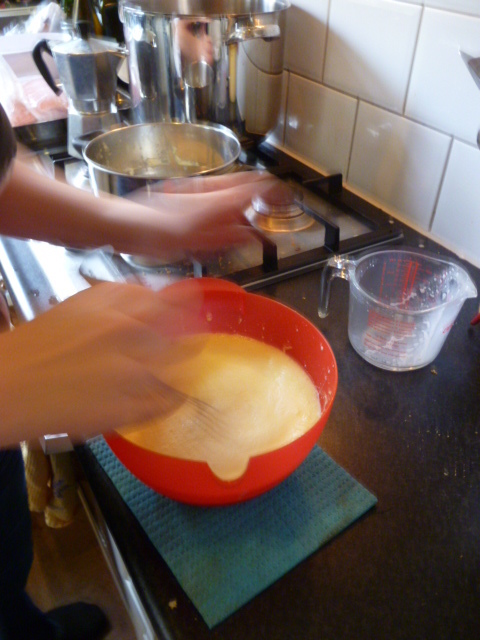 Next, the custard needs to be thickened. 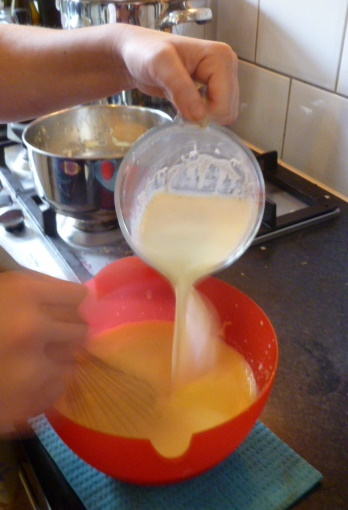 If you are making custard from scratch, you will need to stir it constantly. There is no getting away from this. I like to see it as spending time with the custard rather than getting impatient about it. Making custard can be relaxing, and fairly zen, if you let it. Return the custard to the pan that you heated your milk in. Put it on a low heat and start to stir. 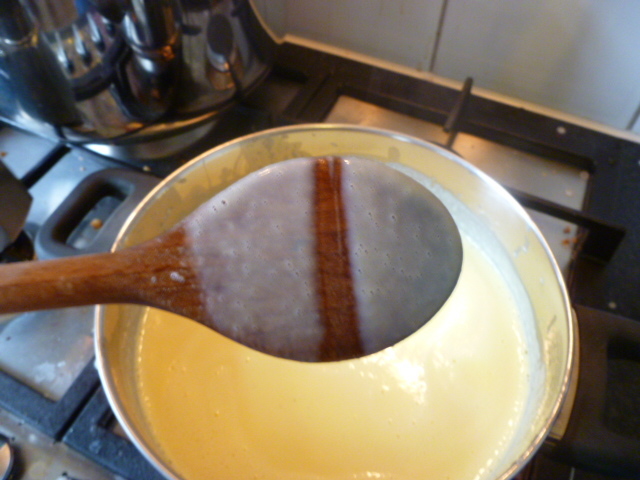 You need to try to stir so that you are moving the wooden spoon over all of the base of the pan, so that no custard can catch on the bottom, and cause lumps. 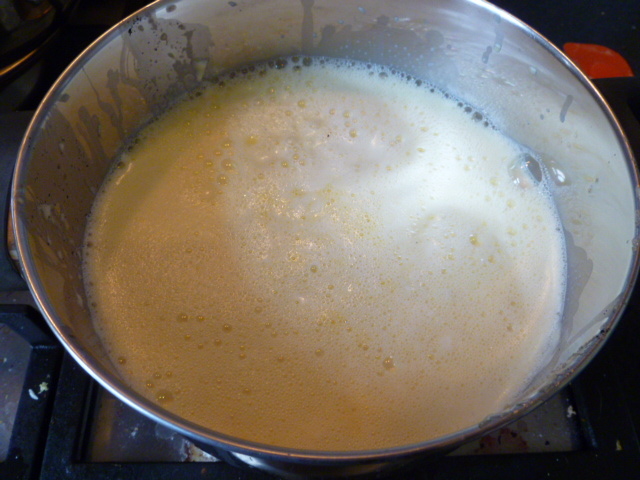 As it cooks, the custard will gradually start to thicken. When you draw a line on the back of the spoon, and the line stays there, and does not run, then your custard is done. Never allow the custard to boil at this stage. If it boils, you will split it, and will end up with lumpy, scrambled custard, which will taste nice, but will look awful and the texture in your mouth will be horrible. If this does happen, don’t despair too much. It can be salvaged to make it passable again, but it will have lost a little of the rich, silky texture that good custard is known for. You can let the split custard cool a little, then put it into a food processor. Start it on a low setting, and gradually increase the speed and keep going until it is smooth again. I got this tip from the Accidental Hedonist a very long time ago, when I first started making custards, and one split on me (or rather, I split it, if we are going for full disclosure…). It really works, and the custard will be almost as good as new. You can pour custard, hot, onto pies and puddings, baked fruits, or fresh ones. You can chill it for use in trifles or flans. Once chilled, you can cover it with sugar that you burn under a blow torch, or a very hot grill for a créme brulée. You can bake it in the oven. You can even bathe in it to demonstrate how wacky you can be to raise money for charity, if you really must (not recommended, better use Bird’s for this purpose). Whatever you do with it, you will have a lovely homemade treat that will impress your friends, and that you can be very proud of. Thanks so much for this comprehensive how-to! I’ve never made custard before, but it’s one of those skills I would dearly love to master. It’s absolutely divine when it’s made with fresh vanilla – unbeatable, in fact.